This paper provides everything you will need to start moving your .NET application over to Mac using RAD Studio 2010. Join Brian Long as he introduces the main differences a developer will notice when working on a different platform, through getting a simple console app up and running, to GUI toolkits and data access. Brian leads you through in easy steps to get fast and powerful results. Download this unique and FREE white paper now! 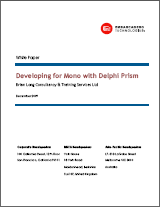 Follow the link to the "Delphi Prism in Action resource page" under the summary and image.